Diwali, the festival of lights cannot be celebrated without 'diyas' in India. 'Diyas' are oil lamps used heavily in this festival. A diya has to be filled with vegetable oil or 'ghee' (Indian butter) with a cotton wick is dipped in it. Thereafter, the top of the wick is pulled up to light it while the rest of the wick stays dipped in oil. 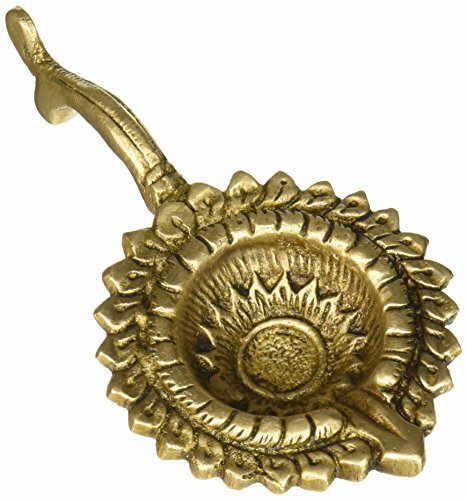 While Clay diyas are used temporarily on special occasions, brass diyas are used as permanent fixtures in homes and temples. Brass oil lamps are handsome to look at and may be used as a décor item for the living room or used on special occasions time and again. You can use this fancy item for a candle light dinner if you like.